Oplev pyramiderne i Oaxaca i Monte Alban, der betyder 'White Mountain', beliggende på en stor bjergtop, med spektakulær 360-graders udsigt over Oaxaca Valley. 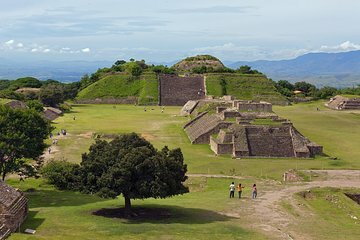 Udpeget til UNESCOs verdensarvsliste, sammen med Oaxaca City, betragtes det førkolumbiske arkæologiske område som den mest storslåede af regionens antikke ruiner. På denne 3-timers guidede tur med bus fra Oaxaca, udforske komplekset fyldt med pyramider, ceremonielle stenhugger, en stor boldbane og 170 udgravede grave. Hotel afhentning og drop-off inkluderet. Nyd midmorning pickup fra dit Oaxaca hotel og rejs med en behagelig træner i ca. 20 minutter til Monte Alban, et UNESCO-websted beliggende på en bjergtop med panoramaudsigt over byen og Oaxaca Valley. Ved ankomsten til det arkæologiske område, udforske med din guide Grand Plaza, et stort åbent område på det udfladede plateau. Hør engagerende fakta om Zapotecs historie og kultur, som du ser på ceremonielle platforme, herunder en række stenskærer kaldet The Dancers (Los Danzantes). Du kan se nogle af Monte Albanas 170 grave, hvis udgravninger afslørede en række malerier og stenskærer. Besøg pyramider, templer, alter og den I-formede boldbane bygget i 100 f.Kr. Gør din vej op ad South Platform (Plataforma Sur), et stort område kendt for sin brede trappe og en fantastisk udsigt. Nyd lidt fritid på det velbevarede sted alene og fange mindeværdige billeder. Din Oaxaca pyramid tur i Monte Alban slutter med drop-off tilbage på dit hotel. Daniel gave us the best tour of Monte Alban. I learned so much this time around my second visit. We enjoyed this 1/2 day tour. The pick-up was on time. The guide was enthusiastic and knowledgeable. Monte Alban is fantastic. discovered less than 100 years ago! Our guide, Antonio, was so passionate about Monte Alban, that he made us wish we had signed up with him for the whole day tour rather than the 3 hour tour! He seems to have absolutely thrived on sharing his expansive knowledge of this area with visitors to his city. Would do this tour again in a heartbeat! ENJOY! I only had a few hours in the morning before a wedding, but I had to see Monte Alban. Logistically, it was easy. I was staying at Hotel Azul, and they picked me up, transported me to their office where everyone on the same tour got put onto the same bus and we were off! The drive isn't too long, maybe 30-45 minutes. Once you arrive, the tour guide gets you inside the complex, and then gives you a thorough explanation about the history of the site, the people, plants, animals, etc. He was really informative and you could ask him anything and he would explain it to you. I took the tour in English, and he was giving everything explained in both Spanish and English so it was great for everyone. The site itself is very wide and open, and there are certain things you can go on, and others that you can just look at, but it has great vistas of the city and the whole area with mountains all around you. --There are tons of daytime mosquitos that are roaming around the entire grounds. They have an anesthetic when they bite so you can't feel them at first like a leech, but let me tell you, their bites get really big and cause big red sores, so either wear bug spray, or wear pants to be safe. -Lots of sunscreen and a hat are needed. You'll be standing outside and walking around for the entire tour, and the sun at that altitude and more towards the equator will wreck you otherwise. Fabulous tour by our guide Apollo. Well organized, informative, and plenty of free time. The bilingual guide effectively communicated in both Spanish and English with ease. This is an excellent half-day experience when visiting Oaxaca. We weren't thrilled with our tour guide. He was very knowledgeable but went into way too much detail. He was going to give us time to wander on our own but time was running out and I don't think we were even 25 through the tour yet. Other groups were walking around at a pretty good pace and we were stuck near the entrance. He also got angry when we wandered to take pictures, saying he would give us time at the end. We paid for the tour and if we didn't want to hang on his every word that was our problem, not his. We ended up asking what time the bus would leave and just taking off on our own so we could see more of Monte Alban. Great site - absolute must visit for anyone in Oaxaca and interested in Zapotec culture and ruins. This review is for the tour itself. Turismo el Convento was the contracted operator we had used them for the Mitla full-day tour earlier in our stay, and that was good all-around. 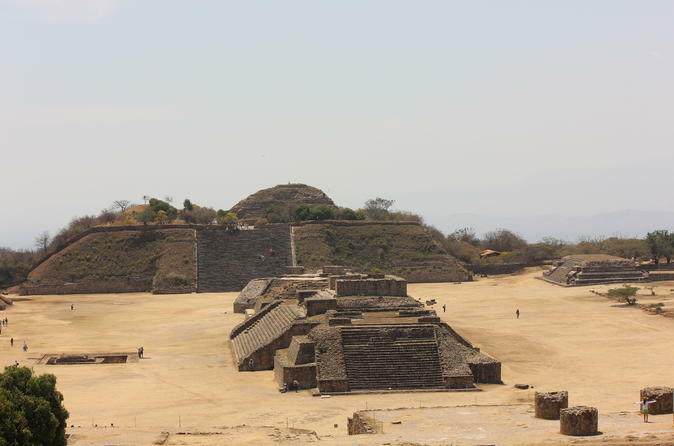 For the half-day option to Monte Alban...the site is within half-hour from city center. You might be better off booking a taxi back and forth, in order to dictate your own timing at the site. As it is, we got picked up at 10am from city center hotel - drove to a nearby meeting spot to connect with other vans from the company and to switch people around which I know is common amongst larger tour companies. Unlike the Mitla experience, the tour drivers / organizers seemed a bit confused - we were mixed in with full-day Monte Alban guests, and they asking us which tour we were on, and looking for people they seemed to not have picked up yet. After the time the half-dayers were all packed on-board and ready and on way, it was just about 11am when we arrived to the site. But then..there was confusion on who had pre-paid entrance to the site, and the van host only had a limited of tickets on hand. I believe since we paid via Viator in advance, we were taken care of - but we still had to wait for everyone else to get through the ticket queue in order to start the in-person tour on-site. So the two of us were left stewing for another half-hour waiting, and wasting time as we knew the end was 1pm. We could have gone off on our own, but would ave missed out on pre-paid guide At 11:30, we finally got the English-speaking tour group together. Now, the guide this day - Antonio - was wonderfully knowledgeable and conscious of keeping time. He has a wealth of experience, and has Zapotec heritage to add color to his commentary. We also experienced him on the Mitla tour, and consider anyone in his group lucky. Again, the site is great and beautiful - smaller than Chichen Itza but comparable to Uxmal, I think. Antonio finished his guided tour at 12:30, which left only a half-hour for time on our own to explore the areas not shown by Antonio - including the primary north and south structures. There was a 1pm hard stop, as we were mixed in with the full-day group, and those folk needed to get moving to their next stop. Understood, but why should that limit the half-day? We could have used at least a half-hour more on our own. I know some other reviewers mentioned they stayed on, and taxi'd / bus'd back on their own - which we considered. The mixture of hectic and confusing pick-up and sorting out the group clouded my experience, as it soured me before we even got to see anything. Based on our experience with Turismo a couple of days before - on a full-day to Mitla - I'd recommend heading to Monte Alban on your own if you're a ruins fan. But if you're a casual tourist not interested in more than a couple hours in the sun walking, then this may work.